This is a collection of nine wonderful short stories by nine wonderful authors. They all take place in log cabins, in different states, in the 1800s. There are several reasons I loved this book. First it deals with log cabins which I think are some of the most romantic buildings ever. The stories all happen in my favorite time period in history. If I could go back in time that would be the time period I would wish to live in. The final reason I loved this book was because it was written by nine extremely talented writers, a few I was unfamiliar with, which gave me the opportunity to experience their writing. Each short story is about fifty pages long. I’ve had the book for quite some time. Whenever I wanted to read something but had limited time I would pick the book up. For me reading a book of Christmas stories is just as special in July as it is in December. So let’s talk about these nine stories. I have to say “Snow Angel” by Margaret Brownley was my favorite. Miss Parker comes west to teach in this one room school house. A lot of the parents don’t have a lot of faith in her ability to survive there. When she and three children are stuck in the school house due to a blizzard, the sheriff must go out to find them. They all end up stuck there. They all have personal issues that make this at times a heart-wrenching and at times a hilarious story. I’ve read many books by Wanda Brunstetter. In “The Christmas Secret” while preparing the house for a Christmas Eve wedding, bride-to-be Elizabeth finds a journal that holds a secret. The secret is enough to make her run away. Now it is up to the groom-to-be to find her and together work things out. “Christmas Traps and Trimmings” by Kelly Hake gives you an idea of what life was like for women in the early 1800s. They had little say over their lives. Mina has been promised to a cousin in marriage. She sets off for American with her nurse in search for Sam her guardian and find themselves in an earthquake. This story shakes up their lives in more than one way. “A Star in the Night” by Liz Johnson is another one I loved. I am very familiar with Franklin, Tennessee. This is set during the Civil War. A Yankee soldier is found near Cora’s cabin in Confederate territory. Cora is dealing with the horrors she has seen in this war while she and her grandfather nurse this man back to health. With their hearts entwined can there be a happily ever after for them? “The Courting Quilt” by Jane Kirkpatrick shows the lengths unmarried women would go to in finding a husband. Richard is a traveling salesman and partners with Mary to help sell her goods. One of his tactics has him convincing women he will propose to them if they “meet the test” as a quilter. From this you know things are going to be hopping. “Under His Wings” by Liz Tolsma is the story of two people who find themselves in a unique situation. 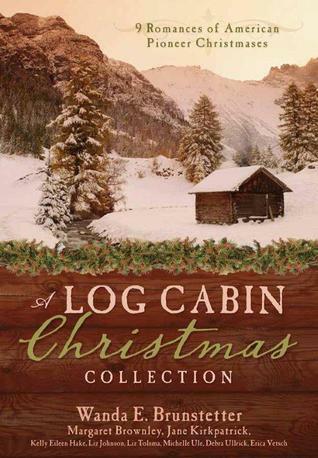 Adie cooks for the lumber camp and lives in a cottage with her father. This is her protection. Noah is working to save money to go to seminary and become a preacher. Then Adie’s father is killed in an accident. She is fair game for all of these men as the only female in camp. Noah is there to protect her if she will only allow him to, even if it is a marriage of convenience. takes place in the Minnesota North Woods in 1875. Beth Sorenson is convinced that she can only be a minister's wife and Todd Rambek, a mere blacksmith, will never do. After all her family has been ministers and wives of ministers for several generations and as a minister's wife she can be in service. The Christmas program that Beth is putting together can only be done by her, no one else is capable of doing it right. But when the unexpected happens and everything seems ruined can Beth learn a valuable lesson in service and see what is right in front of her? Or will Beth drive away those who care for her with her attitude? “The Dogtrot Christmas” by Michelle Ule takes place in Texas. While a man is off to war his land is sold without his permission. He returns to finds a brother and sister building a dogtrot cabin. If you don’t know what this is the look it up. It is quite fascinating and resourceful. Luis must learn to forgive and Molly may just be the one to help him heal. brother-in-law Manuel or will peace elude him? Can Molly's kindness help a soul damaged by war? “A Grand County Christmas” by Debra Ullrick takes place in Colorado. This is a story of loss yet we find God’s goodness through this loss. Widower Amadeus finds Awyna freezing and starving outside his cabin. She’d been out looking for food and got lost. She stays with him and his three children and his mother until the weather breaks. She returns home only to find she’s lost everything. But, sometimes the loss of one thing leads us to what great thing God has for us. “Christmas Service” by Erica Vetsch is one of those stories that can step on your toes. I remember telling my parents I felt God calling me to be a missionary. I was sure I was going to be a missionary like the many I’d grown up learning about. This seems funny because I was such a shy person. I asked a missionary how I could have been so wrong when I became a teacher. That missionary told me that missionaries come in all kinds of packages and for me it was the package of a teacher. So when I read this story about Beth who believes she needs to marry a preacher because that is the only way she can serve God I got tickled. She had a great man, Todd, a blacksmith in front of her that wanted to court her but she couldn’t see it for her own blinders. Sometimes God has to allow drastic things to happen to open our eyes. This book is filled with stories that show God’s infinite love for us as we bumble along in life. It doesn’t matter that these stories took place in the 1800s because they are just as appropriate to today. You know the saying, same situation different setting. I definitely recommend this book and would not wait until Christmas time to enjoy it. We should celebrate the true meaning of Christmas year round.